Today is my birthday and I would love to bake a cake so that we could celebrate together, but since that is not possible I thought I would do the next best thing and make a cake that you can also create. 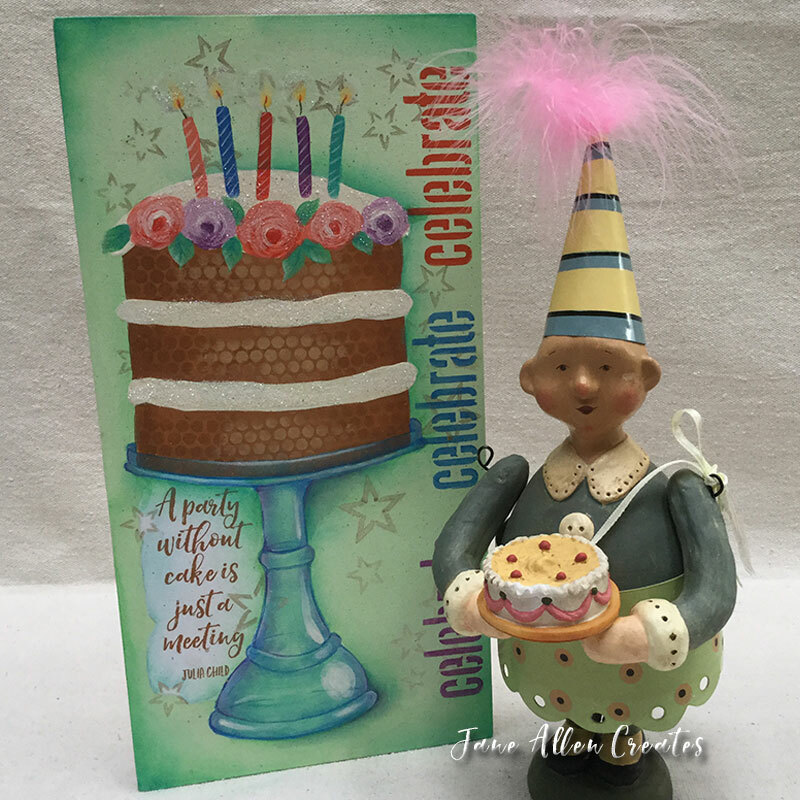 Each day is a gift and deserves to be celebrated…so paint this cake and use it to celebrate each day. I painted this cake on a 6″ x 12″ wooden canvas. Once I sketched out my design I started thinking about what colors to use and decided to challenge myself by using the new DecoArt colors for 2017. I thought the colors went well together. I also used Cadmium Yellow, Camel, Honey Brown, Light Buttermilk, Raw Sienna, Soft Black, and Warm White. I also used DecoArt Dazzling Metallics – Champagne Gold. You can use the colors I did or be creative and use your own colors. Basecoat your canvas with Light Lime. Transfer on the pattern for the cake and cake stand. Trace the outline of the stand with Bright Blue and the cake with Raw Sienna. Print out the quote and tear around the edges. Glue quote to canvas with Decou-Page Matte, allow to dry and then top with another coat of Decou-Page Matte. Stencil stars from Beliefs stencil in canvas background with Champagne Gold. 4. Paint Cake stand with wash of Laguna. 5. Float corners of canvas and shade randomly around cake with Green Tea. 6. Reinforce shading with Laguna. Shade cake stand with Bright Blue. 7. Strengthen shading on cake stand with Brilliant Purple. Lightly wash over quote with Laguna. 8. Float Warm White on top edge of cake stand and on sides of stand. Paint on Warm White highlights. Float Warm White on top of cake icing and randomly on edges. 9. Transfer on pattern for candles and flowers. Using a #2 round brush loosely block in orange flowers with Coral and the centers with Scarlet and the purple flowers with Light Orchid and the centers with Brilliant Purple. Base in the leaves with Green Tree and shade the backs with Laguna. 11. Paint veins on leaves with brush mix of Laguna + Bright Blue. Add a second layer on flowers. On orange flowers begin stroking over flower with Coral in circular motion, wipe off brush and pick up Scarlett and stroke in center and lower side of flower. Wipe off brush and pick up Cotton Candy stroking over Coral. On purple flowers begin stroking over flower with Light Orchid in circular motion, wipe off brush and pick up Brilliant Purple and stroke in center and lower side of flower. Wipe off brush and pick up Warm White stroking over Light Orchid. Paint candles: Coral, Bright Blue, Scarlett, Brilliant Purple, and Laguna using #2 flat. Brush mix Warm White with Cadmium Yellow and stroke flame on each candle. 12. Highlight edges of leaves on one side with a float of Light Lime. If you are happy with your flowers add a few strokes of Warm White in the centers. If you are not happy with them repeat the steps above ending with Warm White in the centers. Paint Warm White diagonal lines across each candle. Shade bottom of flame with Cadmium Yellow. 13. Add Soft Black wick from each candle to flame. Add small dot of Scarlett in each flame. Stencil Celebrate on side of canvas using Brilliant Purple, Bright Blue, and Scarlett. 14. Float Warm White circle around each flame. Flyspeck with Champagne Gold. 15. I used a music print washi tape on the edges of my canvas and painted with a coat of Decoupage to seal. To complete the project I added glitter to the flames, icing and flowers. Using an old brush I painted a coat of StarLite varnish over desired area and then sprinkled with Glamour Dust. Wipe off excess and allow to dry. I work an area at a time. I hope you enjoy this project and thank you for taking a little time with me today on my birthday. And Yes I will still need you, because God made us to enjoy relationships, not just as spouses, but as family, and friends, and even virtual friends. And yes I will still feed you because I love to cook and share food with friends…after all food is love even if it is a painting of food. Thank you for celebrating with me. Remember each day is a gift to celebrate. Yes, I still need you! I LOVE this project. Of course, throwing in the word CELEBRATE cemented the deal. Thank you Charolette for the birthday wishes, I love that your mother and I share the same birthday. We truly are connected! Love to you today as you celebrate your mother! 🎂Happy Happy Ms Jane! Lynda Z. Thank you Effie, I love how art has connected us! Happy Happy Happy Happy Birthday my friend! Love the project! Thank you Amy, thankful that we are friends. Happiest of birthdays Jane. The project like you is the sweetest! And yes we still need you…..your creative presence and most of all your friendship. As far as eating cake while it looks delish I may have to walk around the block twice instead of once …..which I can’t seem to even manage with this winter weather! Thank you Lynn, and thankful for our creative friendship. I am also struggling with getting out and walking….part weather…part desire. Guess it is good this cake has no calories. Happy Birthday, Jane! What a sweet project (love the senitiment :D)! Many blessings in the upcoming year. Happy Birthday to you! Mine was Monday. I love the “cake”. Can’t wait to do it. Thank You Virginia, Happy Belated Birthday to you. Happy Birthday Jame, hope you have an amazing day! Is there a link for the line drawing and quote??? Thank You Virginia for catching that. I just added them. I had added them on my computer last night, but then did a final proof on up iPad and must not have had the final file. Happy Birthday Jane and may your year be blessed and happy with many more birthdays to come. Happy Birthday Jane! Have a fabulous day! Happy Birthday to my special friend. What a wonderful project. You are so creative. I just love reading your blog. You amaze me how you tie in so many interesting and meaningful items. I am so thankful that we grew up together. I will think of that Beatles song now. Thank you Patti. I feel very blessed by our friendship. We started as neighbors as kids, but the years have continued to bless us, we have so many things in common. When I am 64 is only a few days away for you my dear friend. Love you!